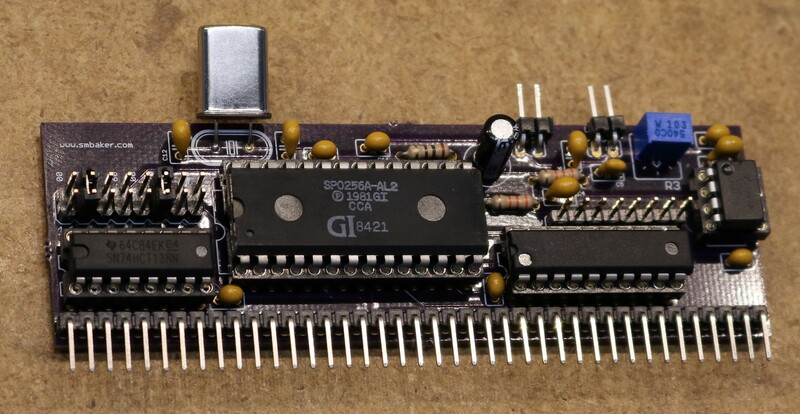 The speech synthesizer IC that I chose is the SP0256A-AL2. One of my reasons for choosing it was that it seemed plentiful on eBay. They’re all fakes though, every damn one of them on eBay, so far as I can tell. Fortunately, there is a reputable seller here in the states, www.speechchips.com. The circuit is relatively straightforward. The SP0245A-AL2 is connected to the data bus via D0-D7. 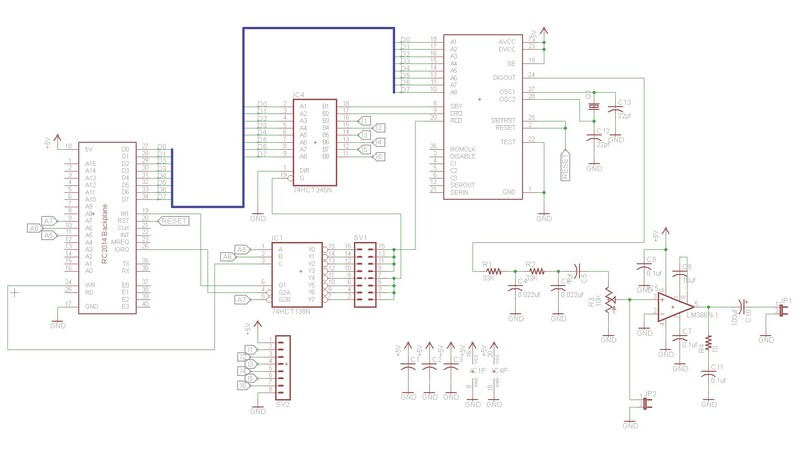 There’s an active low signal, ALD, that causes the SP0256A-AL2 to load whatever is on the data bus, and we connect that to a 74HCT138N for address decoding. The SP0256A-AL2 provides two status signals back to the CPU, I tied them to the data bus using a 74HCT245N. Writing to the port selected on the 74HCT138N will write to the synthesizer, and reading from that same port will read the status back. Using the chip involves writing a phoneme, and then polling for the chip to become ready before writing the next phoneme. An alternative implementation would be to use an interrupt handler. I didn’t want to worry about sharing interrupts between the speech synthesizer and the serial port, so I went with the polling solution. Here’s a picture of the pcboard. You can find the source code in my repo at www.github.com/sbelectronics. There’s a demo program that says a couple of phrases and is able to recite the lyrics to Daisy Bell. You can find the pcboard on Osh Park. You’ll have to buy them in three quantity because that’s the way Osh Park sells them.